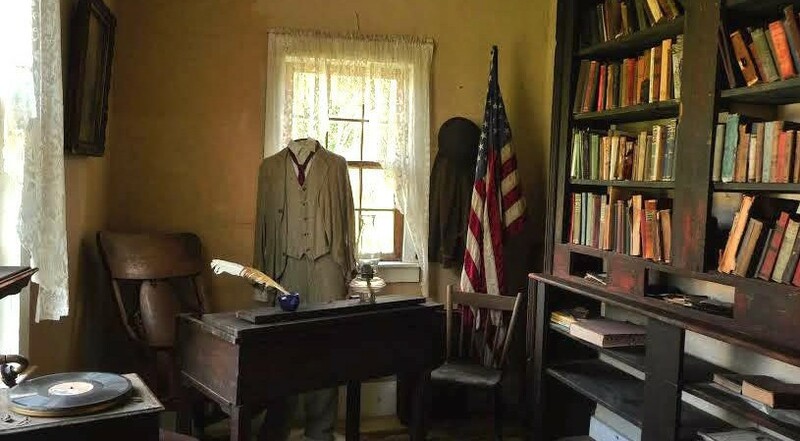 – A recreated Western Reserve village of the 1820's to 1920's. The museum is comprised of 40+ buildings rescued & moved from six N. Ohio counties. The buildings and barns contain thousands of tools and artifacts, representing every craft and trade common to a small town 150 yrs. ago. The oldest building dates to about 1799, and the oldest artifact (the Lewis loom) dates to 1725. The museum is free and open to the public. Please enjoy exploring the many pages listed beneath the picture, and reading the below blog of the stories of events & acquisitions at the museum. Please visit www.stonegardenfarm.com or go to Stone Garden Farm on Facebook for listings of the heritage skills classes we offer and for other events of the farm and the farm products and foods we sell. The museum received a fantastic donation today. An all original Studebaker buggy. Elyria was founded in 1816 (just 40 years after the establishment of our nation) by Herman Ely from Massachusetts. He came to the Western Reserve on horseback and built a log house close to the Black River (close to where Original Peoples were camping). He also built a dam, gristmill and sawmill on the site. The sawmill was built near one of the waterfalls and they used the lumber to build more houses to accommodate immigrating settlers. Just 36 years later, when Mr. Ely died in 1852, Elyria had five churches, three grocery stores, three flour mills, a newspaper, and a population of more than 1500 people. At the turn of the century, the Ely family owned a buggy. 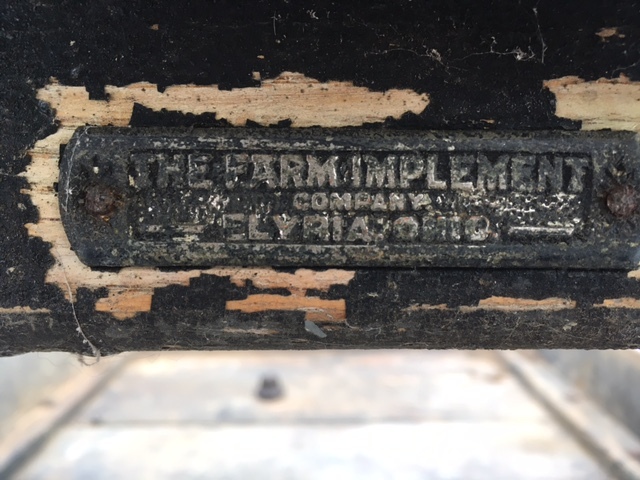 They had acquired the buggy from Elyria Equipment Company, in Elyria. The family gave the buggy to the Ingersol family who used it for a short time. The Ingersol’s then gifted the buggy to their friends, the Gest’s, when they were married about 1910. The buggy was used by the Gest’s until they gifted the buggy to their grand daughter (the oldest sister of Richard Wise) on the occasion of her wedding in the late 1960’s. 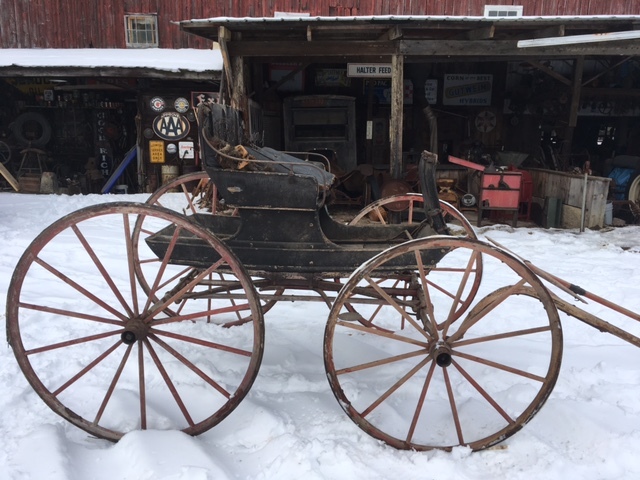 Eventually the buggy skipped back up a generation to Richard’s parents, who stored it for a time in a barn in Belden. About 1990 it went to a cousin, and finally Richard acquired the buggy in the summer of 2017. He kept the buggy in his barn in Wellington. The 108 years of the Gest/Wise Family ownership of the buggy finally ended in Feb. 2018 when Richard and his daughter, Wendy, donated the buggy the museum. Their donation completed the buggy’s journey from the original seller (the Elyria Equipment Co.) to its first owner, the Ely’s, and eventually to the Gest’s and to their descendants. The museum has never seen such a well documented buggy. Buggies and sleighs from before the turn of the century always had small brass tags marking their builder. But for those conveyances that have survived to present day, the tags have almost always been removed by “tag collectors”. It’s rare to find the original maker’s mark on either. It’s even more rare to find a tag bearing the name of the seller of the equipment. In fact, I’ve never seen or even heard of one. But this wonderful buggy bears both, …probably because one family has owned the buggy for nearly all of its life. But there they are, Studebaker Company, South Bend, Ind. and Elyria Equipment Co, Elyria, Oh. This entry was posted in Uncategorized by Jim Fry. Bookmark the permalink.